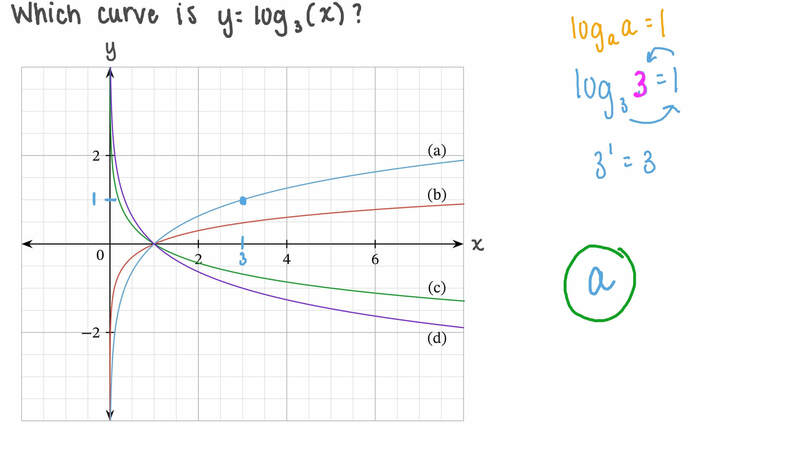 In this lesson, we will learn how to sketch logarithmic functions and how to determine the function behavior at infinity. Which curve is 𝑦 = ( 𝑥 ) l o g 3 ? For which values of 𝑎 is the function 𝑓 ( 𝑥 ) = 𝑥 l o g 𝑎 decreasing? Use technology to plot the graphs of 𝑓 ( 𝑥 ) = 𝑥 − 3 𝑥 3 and 𝑔 ( 𝑥 ) = 𝑥 l n . Find the coordinates where 𝑓 ( 𝑥 ) = 𝑔 ( 𝑥 ) if the curves intersect, giving your answer to two decimal places. Use the graph of 𝑦 = 1 0 𝑥 to list the values of l o g 𝑛 for 𝑛 = 2 , … , 6 to two decimal places. For example, we see that l o g 2 ≈ 0 . 3 0 .